Interview: As Queen Elizabeth I, D’Aquila explores the heart of a woman who sends a treasonous lover to his death. Timothy Findley’s play runs through Jan. 22 at Chicago Shakespeare Theater. To put it mildly, “Elizabeth Rex” is an intensely emotional play. It’s Findley’s imagined riff on the historical night before Elizabeth’s former lover Robert Devereux, the Earl of Essex, is put to death for treason. Distraught with grief at having to go through with Essex’s execution, Elizabeth has beguiled the evening by watching a command performance of Shakespeare’s “Much Ado About Nothing.” Now she seeks further distraction – by joining the Bard and his fellow thespians in the royal stables as she awaits the death knell. But the queen gets more than she bargained for. Her internal conflict between Elizabeth the monarch and Elizabeth the woman is thrown up in her face by one of the players, Ned Lowenscroft, the master interpreter of Shakespeare’s women’s roles who also happens to be terminally ill.
“Elizabeth begins by telling Ned, ‘I require distraction,’” says D’Aquila, “and, boy, does she get it. She invites him to ‘play whatever you choose, whatever role, whatever temper.’ She doesn’t realize what she’s getting herself into. But she also tells Ned, ‘I’ll teach you how to be a man if you can teach me how to be a woman.’ Ned is a loose cannon. He’s openly gay, a bit of a bad boy and a trickster, and he has been deeply hurt in a relationship. But there’s nothing wimpy about him. He’s male and Elizabeth loves that. He’s also very emotional. He declares that men weep, that it’s not just feminine.” Thereby suggesting that it’s admissible for the queen to shed tears for Robert. Well versed in real-life suffering and with nothing to lose, Ned (Steven Sutcliffe) prods the troubled Elizabeth with the audacity – and impunity – of one of Shakespeare’s wise fools. And so the night spins inexorably toward the terrible dawn and apparent certainty that the queen’s beloved Robert will meet his doom. D’Aquila, a Minneapolis native who now lives in Toronto, was a close friend of Findley (1930-2002) and created the role of Elizabeth when the play premiered at the Stratford (Ontario) Shakespeare Festival in 2001. In revisiting the queen’s torment at CST, she says she was reminded that it’s a long night for Her Highness. To play out too much of the emotional string too soon can rob the drama of its powerful ending. “As an actor, you want to go straight to that emotion, the core of what makes it a drama,” says D’Aquila. “I call it going to the pity party, where you can feel sorry for yourself. But if you hang on to that intellectually, and not go there emotionally until the very end, you build something of great strength. As Elizabeth, I have to leave the emotional realm to Ned. That’s his territory. The very title of the play reflects the queen’s perilous position. In the course of the night, the woman who should be called Elizabeth Regina (Queen) styles herself Elizabeth Rex (King), a pithy summation of the transgender, double life she leads. When D’Aquila first prepared to play the role – “God knows I read just about everything written on the subject” – she came to appreciate Elizabeth as an extraordinary woman in a man’s world, and as a daughter with highly conflicted feelings toward her father, Henry VIII. “Henry was a beloved king, as she was beloved as queen. He was bigger than life, and she spent much of her life emulating him. He was the showman, an artist. He loved hunting and bear-baiting and dressing up. But he also had Elizabeth’s mother beheaded. After her mother was killed, she was sent off to her own little palace, away from London. Very occasionally, Henry would come to see her. But she had the same education as her half-brother Edward — multiple languages, a knowledge of history. And she learned to survive at a very young age. And so did the arts, theater among them. The historical Elizabeth was familiar with Shakespeare’s company of players, known then as the Chamberlain’s Men. That acquaintanceship resonates in Findley’s play and indeed sets up a dichotomy in the queen’s relationships with the emotionally charged actor Ned Lowenscroft and the rather distant but ever listening and processing Shakespeare (Kevin Gudahl). Whereas Shakespeare engages the queen’s torment with measured reserve, Ned swoops about her like a moral conscience, challenging, badgering, provoking. So convincing is D’Aquila’s queen that even several days after seeing the play, one feels a certain uneasiness in addressing her as anything less the Your Majesty. 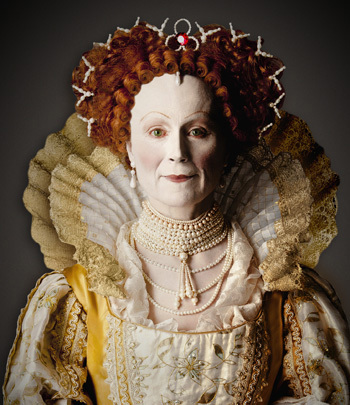 She merely passes the compliment along to director Barbara Gaines, whom she credits with saving her from an impulse to embroider Elizabeth’s royal sleeve with her grief. Photo captions and credits: Home page and top: Diane D’Aquila. Upper right: D’Aquila as Elizabeth I (Photo by Peter Bosy). 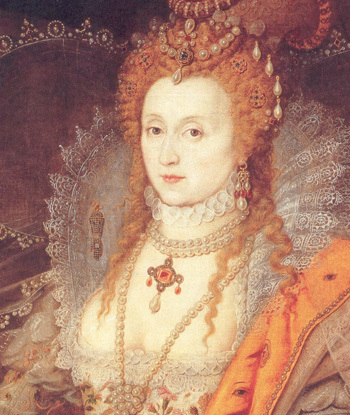 Lower right: Queen Elizabeth I as painted by Isaac Oliver in the so-called Rainbow Portrait circa 1600. 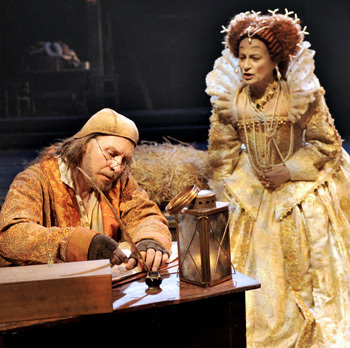 Upper left: The Queen (D’Aquila) talks with Shakespeare (Kevin Gudahl) (Photo by Liz Lauren). Video below: D’Aquila in scenes from a previous production of “Elizabeth Rex,” for Canadian Television.